This set of rules has been extremely controversial and polarizing. The majority of feedback I've read 'around the net' has been negative, sometimes overwhelmingly so. I wasn't a fan either for the first few games I played with Khaine magic, both me and my opponent were a little overwhelmed by choice, the phases took too long, and certain combinations seemed overpowered beyond belief. However after thirteen games with Khaine rules I have to say I've become a fan. Phases became much faster as the rules and strategies became more familiar, and now I find I know exactly what I'm going to do in each magic phase before it starts, often a turn or two before...I'm planning ahead as I did with the old rules. I feel there is a lot more strategy, a lot more thought has to go into each phase, and magic phases are dominated much more by multiple low cost spells, with high cost spells occurring less often than before. I prefer this and I honestly think its a better phase than before. I've heard and read a lot of negative comments about how it's 'random' but I strongly disagree. Things were far more random under 8th Ed rules, where options were always incredibly limited, power dice were sparse, and one bad roll meant broken concentration and your phase was done. Under 8th Ed rules the effectiveness of a magic phase was based more around luck of dice rolls, while I feel the effectiveness of a Khaine phase is based much more on sound planning and decisions. 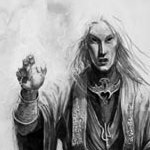 Unfortunately some people are so violently opposed to Khaine magic that they have no interest in even experimenting with it. I'm fine with this and I'm happy to play normal 8th Ed with anyone who really doesn't want to try Khaine, but I hope more people will try it and come to like it, once they get over the initial shock of the changes. 4D6 power dice, best 2 dispel dice. No limit on casting or dispel pool. You can recast a spell if it is successful, but not if a spell is dispelled. Keep the D6 limit for number of power dice, but remove the limit on dispel dice. I think this is a nice compromise that keeps the best of the strategy elements from Khaine magic, but should be much more acceptable to those who hate the Khaine rules. I still believe it takes too long, specially if you favour, as I do, lower casting values. With that said, you are "overcomping" the system. 2) <Limited spell choices> + <dispel = no recasting> + <dispeller doesn't has a cap on dispel dice> means the opponent must spend a huge chunk on magic if he wants to be able to make some use of the magic phase: The dispeller will always be able to shut any spell he doesn't like, and if at any point the caster fails -any- casting attempt, his magic phase might as well be inexistant. Basically, the defender doesn't need to resist all casting attempts. Just needs to dispel once each spell. The system itself isn't bad. Just limiting recasting to succesful, not dispelled spells should be enough. The big problem is still how long it takes. As for ET spells, if you tone them down, I think they'd be viable. Their main perk is being undispellable, after all. Change metal to 4++ instead of 2++, for example, and it's still a gamble that can help, but doesn't break the system. I like those rules a lot, but it would be fun with toned down spells. It works fine unless you cast some uber powerful spells with opponent having no means to dispel it anyway. It would be fine if spells weren't able to anihilate whole armies or winning you whole games straight away. And with magic winds gone somehow after ET I suspect spells to be less over the top. IMHO it takes too long and removes some of the tactics from the phase. Not being in control of how many dice you cast/dispel with is just a really bad idea. The other changes such as no loss of concentration also change things too much and for the worse by allowing spamming. The current magic phase works really well. Why fix what isn't broken? About the only thing I like in the suggestions is the miscast idea where you roll and add the number of dice you use to cast. It would make people think before casting with 6 dice to get IF assuming the table gets worse when the results are higher. I like the OP ideas. Dwarfs are already pissed about Khaine magic. I'm not sure any of this is necessarily going to help them at all. Khaine magic basically gave every single army a huge advantage over them that they have no way of mitigating. Sure, they can eat your nuke spell... off of one mage... but then you have another one who knows another nuke spell, and you're just going to spam buff spells anyway. I think the multiple castings are an issue. Wyssans alone is absolutely devastating if cast even twice on the same unit... much less more than that. Ditto Iceshard, or many others. These rules had potential but two things cause them to break. 1) the d6 rolled before you cast or dispel ruins the interactive exchange between the two players. Magic went from a game of baiting dice and poker to the players becoming isolated whenever one player rolls high and the other low. 2) the recasting even if dispelled is where broken combos happen, and it was a mistake to go that far. 1) 4d6 winds. Highest two for dispel pool. Highest+lowest for reign of chaos. 3) miscast based on number of dice rolled. 1-3 dice = as normal. 4-5 dice = d3 wounds from hits and +1 to effects like instant kill and lose a spell. 6+ dice = d6 wounds and +2 to negative effect chance. 4) wizards all generate spells normally, except they know the signature spell in addition to their spells AND level 3+ wizards know their end times spells. 5) revise OP end time spells. 2++ is too much. 3++ is about right. 6) recast any spell casting value of less than 15 if not dispelled. Then, this segues into 9th. 1) winds go back to 2d6. 6) clean up nuke spells and other trouble maker with revision of brb lores. I think this gives us a more tactical, storm of magic feel. Keeps the interacting between the players. Punishes six dicing and discourages 15+ spells. Then nicely cleans up magic for 9th. I think your developments are a bit more in line with what I would like to see najo. P.S. Good to see you on the forums over here! Hey John! Good to see you too! I was curious to check out the heart of the khaine end times and see how the high elves players were doing. You play high elves? My biggest problem is with the 1d6 power dice. I think a D3+ wizard level would have been better. Yeah. I've only recently started with VC and as I don't as yet have anything painted I tend to end up playing HE at any events I go to. level 3+ wizards have 'access' to all spells. By 'access', I mean that they still generate then as before (e.g. by rolling) but a level 1 or 2 couldn't roll for spell 4, 5 or 6. I like this because it means that you can better predict what spells a level 1 or level 2 mage will have. I highlighted in blue the ET:K rules and left unchanged the house rules. Be reminded that ET:K deliberately increases the magic power, because of fluff. 9th ed fluff might not keep the magic burst. So either 9th magic is overwhelming, and WH9th = MagicHammer, or magic goes back to normal and you'll not get 4D6. One of the problem that ET:K magic solves is the ineffective magic phase in larger games. In 8th edition, magic is OP in small games and has little effect in very large games. For a better balance, one might wish that in 9th ed, you'd roll something like 1D for winds of magic for each 1000 pts of army, and keep half of the dice (the best ones, and round up the number) for DD. Besides that, I like a lot the suggestion to select as many spells as your level, rather than random them or get all of them. Because I really think you should get a realistic chance to cast something every turn in a standard 2400 point game, and that frequently wasn't happening in the old rules with 2D6. 3D6 could be a nice compromise for standard sized games. Using the lowest and highest dice for the dispel dice pool should keep things fairly balanced. A perk I would love to see added to Wizards (not so much the magic phase) is that they gain Magic Resistance equal to their level. Would allow wizards to be used more strategically in defence with the units they deploy in. Additionally I think it makes sense that a mage shouldn't be able to as easily snipe a fellow mage with magic as easily as say a combat hero. 2D6 winds below 3000. Highest roll for dispel dice. 4d6 winds 3000 or above. Sum of highest 2 rolls for dispel dice. You can recast a spell if it is successful and it costs less than 15 power, but not if it is dispelled. 15+ spells may only be attempted once per turn. Choose a number of spells from available Lore(s), one for each level. Teclis may choose any 8 spells from any of he eight lores (including multiples from the same Lore if he wants). Loremaster of Hoeth has the 8 signature spells. You can choose to use up to 6 dice for casting or dispel. If you roll a miscast on a spell after using 5 or 6 dice, roll only 1D6 on the miscast table (ensures a bad thing will happen!). A miscast using 2-4 dice rolls 2D6 on the miscast table as normal. A level 1 or 2 mage has magic resistance 1. A level 3+ mage has magic resistance 2. Dwarfs get to add 3 to dispel rolls, instead of 2. This ability is lost if they have a mage on their side. Last edited by Ladril Caledor on Mon Jan 12, 2015 6:24 pm, edited 1 time in total. Looks like we have some secret undead Elves amongst us.